( right?? ), have never seen a piecewise function, can’t find the domain of a rational function, can’t recognize a basic vertical shift etc. Sigh. I guess my surprise and confusion that they were at this level was pretty obvious, and both of my classes seemed embarrassed by not knowing things that I thought they “should have” and, yeah, worried that they were “dumb.” I sort of realized that I hadn’t bought into the growth mindset as much as I had thought – They’re weak? No. I was comparing them to the students from last year instead of just assessing their level of math and working from there. Observations: Though some of the questions were certainly leading, the students seem to really buy into the ideas and remember our growth mindset conversation. 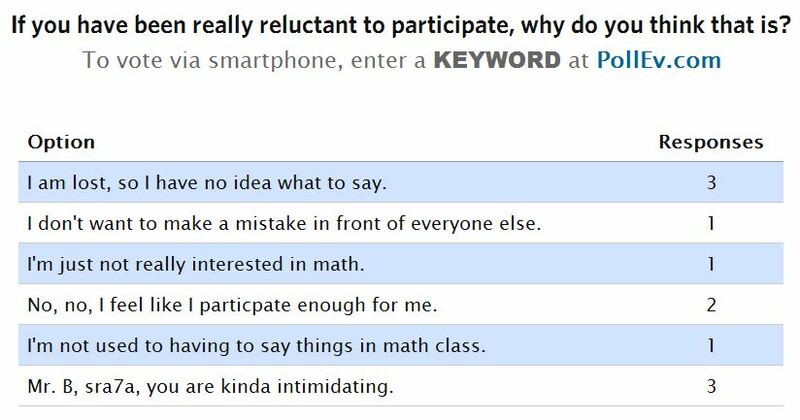 The questions were ordered perfectly, because after everyone realized that no one else judges other people for making mistakes, they were forced to think about really why they were having a hard time participating in class. We went through each of the statements for the last question and talked about if we believed that statement, how the results from the previous two polls might help us participate more. It was a really nice conversation and seemed effective. I saw that look that the students get when their gears are turning and stuff is clicking. Side note: I was a little surprised that students voted for the “Mr. B, you are intimidating option” but I used that as a spring-board to remind them that I buy into the growth mindset idea too. (Also, sra7a means “honestly” in Arabic). How do I know this was a wonderful use of 10 minutes? The first response to the question above was “Thank You” which was surprising and actually pretty touching. And theeeen, it quickly devolved into things like “Bring lasagna to class” and “apple juice breaks.” Really senior-in-high-school? Apple juice? Thanks for ruining a rare sentimental math moment. Moral of the Story? Growth Mindset takes more than a description and a survey to create buy-in. I will remember that teachers can unintentionally send subtle signals through their behavior. I’ve learned from my mistakes with this, which, paradoxically, will lead me to encourage lots more mistakes. I’ll certainly be coming back to this throughout the rest of the year.